Many people don't understand what makes effective head lice removal. An early or light infestation can be treated by a parent in a short period of time using Lice Treatment Center® lice-removal products that contain natural, non-toxic ingredients and organic active ingredients. A heavy infestation may require help from LTC’s lice-removal experts to effectively remove all the insects. Head lice are among the most common problems children bring home from school. This is because lice are so easily spread from one person to another – especially in schools where head-to-head contact among students is common. More than 90 percent of all U.S. families search for home lice removal products at least once each year. What's involved with head lice removal? If your child comes home with hair lice, it’s important to address the situation immediately, because head lice reproduce very quickly. Do not procrastinate. Jolis Cheveux™ products are formulated using natural, non-toxic ingredients, active ingredients and are a healthier alternative to other market brands that may contain amounts of insecticide. Click here to view all Jolis Cheveux™ by LTC products. What if I can’t eradicate lice using a home treatment? 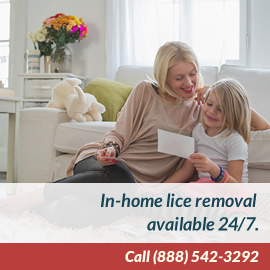 If someone in your family has a serious hair lice infestation, Lice Treatment Center® can send LTC-trained lice-removal technicians right to your home to do on-site hair lice removal. What are the steps in a head lice removal? Our LTC-trained technicians will arrive at your home within a few hours of your call – armed with all the tools necessary to solve your lice problems. Our technicians are experienced and will be courteous and empathetic. We recommend that every person in the home or anyone who has had physical contact with the infested person be inspected for the presence of head lice or nits and be treated, if necessary. Our goal is to come into your home and get your family back to normal in the easiest, most cost-effective way possible. The technicians will apply LTC’s natural, non-toxic products – Jolis Cheveux™ by LTC – to treat the infestation and to facilitate the removal of live lice and nits (lice eggs). 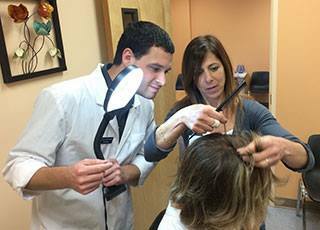 For each infested person, our technician will separate the hair into small sections and, using our special lice comb, inspect each hair strand and the scalp for live lice or their eggs (nits). The technician will then manually remove the bugs and nits strand by strand using a special magnifier and light to ensure thorough removal. This meticulous combing procedure usually takes from two to four hours, depending on the level of infestation. Our technician will leave the infested person or persons with our Jolis Cheveux™ by LTC Treatment Oil still on the scalp. The treatment oil will kill any remaining live bugs (nits cannot be killed and must be physically removed from the hair). Any remaining treatment shampoo will be left with you for future use. Click here to view all Jolis Cheveux™ by LTC® products.